Event Info: Ferocious Fun Lives Here! The Fisher Cats Assurance Ticket is your insurance against "life happening". When you purchase a Fisher Cats Assurance Ticket you are purchasing a fully transferable ticket. This a great option if you think your plans or numbers may change, but you want to get great seats now. Your tickets are fully transferable one time to any other game at any time prior to or after the game, providing the ticket has not yet been used. Sam Adams Brewhouse: 2 Hours prior to game time. Party Decks, Luxury Suites, Birthdays, and Seating Bowl for Season Ticket Holders: 1.5 Hours prior to game time. 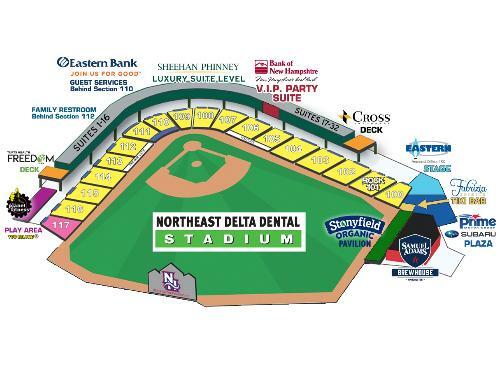 * Please contact the Fisher Cats ticket office at (603)641-2005 so that we may best accommodate your party. If less than 5 innings of a game is played (4 1/2 innings, if the Fisher Cats are ahead) any ticket to that game may be exchanged for one of equal or lesser value to any remaining regular season home game that season, based on availability. On games with an Atlas Fireworks Show, sections 116 and 117 will be cleared late in the game to allow the fireworks show to take place.